Passenger safety is our top priority. All public transport vehicles are fitted with CCTV security cameras, which are used in accordance with ACT Government guidelines, relevant regulations and legislation. Passengers are required to signal the driver of their intended bus service. When boarding an accessible bus service, wait for the bus to lower before boarding. In the evenings, the blue light on buses is for visibility purposes for other road users. Please do not talk directly to the driver while the vehicle is moving. Vacate marked spaces and seating for passengers with wheelchairs and prams, or those with a disability, seniors and those less mobile. Ensure brakes on wheelchairs and prams are activated. Watch your step when entering and exiting your bus or light rail service. When planning to alight, remain seated or continue holding a handrail or strap until the vehicle comes to a complete stop. Take a seat if one is available, otherwise hold onto handrails and straps. Be considerate of leaving space near the doors to allow other passengers to alight or board the service without obstruction. When seated, keep both feet planted on the floor in case the vehicle is required to stop suddenly. If you’re travelling with bulky items including oversize baggage, walking frames, or strollers, please consider stowing them in the provided storage space to limit safety risk for all passengers. 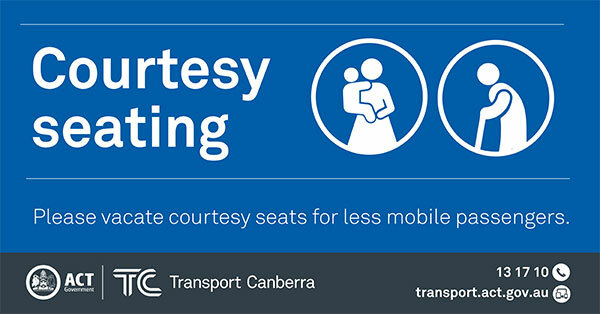 If you have an enquiry about safety on public transport in Canberra, please contact us.